Soft, watercolor roses are the focal print of this sweet floral fabric collection. In shades of coral, palest green and pink, Sweet Baby Rose is the perfect collection for both quilts and home decorating projects. Included in the collection are tiny rose bouquets, a wonderful wall paper stripe, mini leaves and medallions. 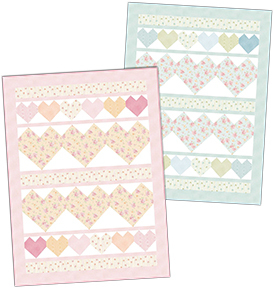 The entire effect is soft and relaxing - perfect for a bedroom or sweet baby dresses.